In the transition to the post-Millennium Development Goals era, many low and middle-income countries will be making significant shifts in their national health policies. The leadership that is drawn upon to make policy changes tends to be in ministries of health, flagship hospitals, physicians and nurses associations, and social protection entities. Health professional schools are an additional and valuable—yet often overlooked—source of leadership in health reform and health policy-making. 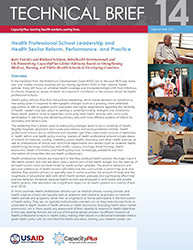 This technical brief highlights some examples of how the education and research leadership of health professional schools has engaged, influenced, or obtained resources from national policy-makers and others with significant influence on the health sector. The brief also reviews instances in which different health educational institutions and professional associations have worked to shape national responses to health system needs. A printer-friendly version is available. The views expressed in this document do not necessarily reflect the views of the United States Agency for International Development or the United States Government.